Ferrari. At Monza. Winning. Awesome! If you ever get a chance to see an F1 race I'd guarantee this place would be a very nice start. Monza is part of a triumvirate of the best F1 tracks along with Monaco and Spa. There's something delicious about watching a 200mph carbon machine balancing on the edge of an apex as prancing horse flags float in the background. Oh yeah; Alonso won which brings him right back in to the sharp end of the drivers championship. I guess I should balance out all this enthusiasm by declaring the race tended to be a little lacking on the race-craft front. Most of the race's action occurred on the first lap when Button flicked his wrist and said toodledo to Messrs Ferrari whilst further back Hamilton was testing the limits of his suspension strength by breaking it in with the help of a Ferrari sidepod. Alas that's how it stayed for the first half of the race, Button in first with Alonso right behind followed by Massa. We all hoped for a glorious pass by the Ferrari to claim first place but unfortunately it occurred during the pit stops. Boo. Then they raced to the flag. 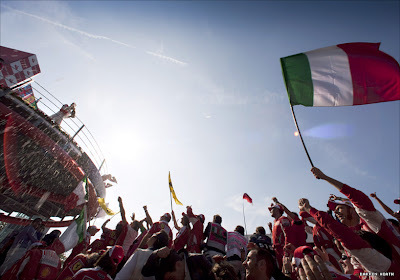 Not that the tifosi really cared, if the car is red you are a God in Monza. Witness the scenes of McLaren driver Mika Hakkinen being decimated by fans after he crashed out of the '99 race at the height of the championship battle. No such drama required today Alonso did the job and is firmly back in contention. Does this championship get any better? Button and Vettel crashed out at the last race in Belgium and this weekend Hamilton and Webber screwed up. Its as if they're each taking turns to crash/win just so that the championship will have to go down to the wire in Abu Dhabi on November 14th. F1 Car vs Le Mans Car: Who Wins?